I’m back to heal the country … and the world! After 5 seasons of the TV series, I knew I wanted to set the show aside in order to create some time in my schedule to pursue other projects. 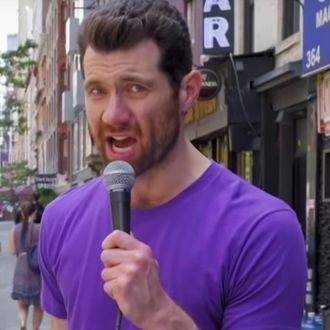 Now that those are taking shape, I’m truly thrilled we’ve found a way to bring Billy on the Street back that makes so much sense for this particular show. As we all know, this is a very divisive, anxiety ridden time and I hope these new segments — featuring the most stunning roster of guests we’ve ever had — give people a small burst of joy in their timelines while allowing me to comment on culture and the world at large in the unique way this show allows me to. According to a press release sent out by Funny or Die today, the new batch of episodes will be released online on Eichner’s Twitter, Instagram, and Facebook accounts, as well as the Billy on the Street YouTube channel, Funny or Die’s social-media platforms, and the Funny or Die website. The new season was produced with Funny or Die through a partnership with Lyft, so expect lots of #brandedcontent jokes.